Hawaii Fitness Clinics & Workshops at Hawaii Academy- Open to all ages! Hawaii Academy offers a number of workshops, clinics, symposia, etc., covering many topics including twisting, safe falling, spotting, handsprings, flipping, and instructor training at multiple levels, for the public and in-house employee training. HA provides monthly workshops on safe falling for instructors to integrate this information into recreation classes and to those interested in the topic. We also offer special outreach lectures to private groups, and special training for select groups by contract. Workshop participants have been students of all ages, teachers, therapists, coaches, medical practitioners, extreme sports enthusiasts and professional athletes. Certification is available for $60. Those with experience may complete training in these lessons but those certified must be able to conduct safe falling workshops without assistance. $20 for a 2 hour clinic! This workshop is required for all new HA employees. This clinic introduces the fundamentals of human twisting in vertical, horizontal, and inverted positions as well as in single, double, and triple somersaults. Training progressions and forms of assistance (i.e., graduated spotting, bungee, belts, etc.) are discussed as methods of facilitated (expedited) skill learning. No previous experience is required. 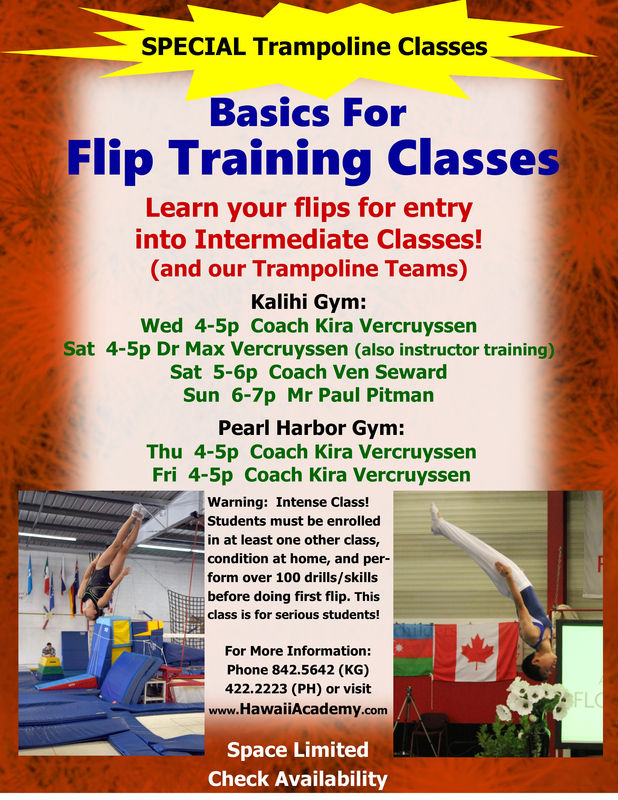 These clinics/workshops concentrate on front and back single handsprings and whips to twisting multiple somersaults in probably the best rebound training facility in the Pacific: (Hawaii Academy–Kalihi Gym). Only Instructors having had training in the proper use of bungees are permitted to use these systems at HA. We have 14 overhead rigs for rope and bungee training. This clinic demonstrates progressions for teaching advance flipping and twisting skills plus insures that all participants can safely and effectively use these overhead systems. After presenting curricula taught at Hawaii Academy, this clinic provides a special look at our students in terms of who they are, how they learn, what we are teaching, and how they develop (age 1-99 years). Theories of learning and development are presented in the context of how they apply to the needs of HA teachers. This is a valuable clinic for Academy instructors and Physical educators in general. Presented are essential fundamentals of skill acquisition and pedagogy. This is particularly useful for beginning teachers to learn the vocabulary of educational psychology and for successful instructors to share how they applied these principles. Discover some secrets for becoming a great teacher. This clinic will teach instructors how to effectively teach Parent-Tot and Preschool Classes. Mr Lane is HA’s PT/PS Program Head and has had many years experience specializing in this target clientele. Curricula, class format, and many ideas for captivating, engaging, motivating, inspiring, and impressing students (and parents) will be discussed. All HA instructors test themselves and their students twice annually and need to know how to properly collect these data. Also, HA’s Fitness Program is launching new fitness classes that requires additional training of all instructors. This clinic introduces the new (revised) Fitness Program and provides training on each test along with ideas for conducting fun and educational classes. Fitness Classes do not usually involve trampoline or tumbling equipment especially when the gym is busy with other classes. . However, they do include indoor and outdoor special conditioning, regularly test 1, 5-mile, and 12 min outdoor runs and vary a lot in what is taught by each instructor (e.g., Kick-Fit, Zumba, Yoga, Tricking). This clinic helps Hawaii Academy employees (and any-one else participating) to understand results of the Academy’s biannual fitness testing, student rankings and re-port cards, and other statistical information in order to identify the most outstanding individuals (the highest and lowest scoring). The best-scoring require fast-tracking (promotion to higher levels according to an accelerated schedule). The lowest scoring require remedial training. Usually Taught by Caoch Nani, HA’s Trampoline Program Head, these clinics are meant to instruct those who have not had much previous trampoline experience with techniques to teach basic trampoline skills. Routines and all the skills in them are reviewed. Also discussed are when to promote students to Intermediate-level classes. Attendees should come ready to participate and do the skills themselves so that they can later demonstrate these skills to their classes. This is an important orientation that all instructors should have, regardless of their previous sport background. Novice instructors for better teaching and experienced instructors to learn to teach this clinic in the future. These clinics take many forms from instructor training for coaching seniors to actual training of senior participants in acquiring motor skills enhancing fitness, and recovering and maintaining balance.